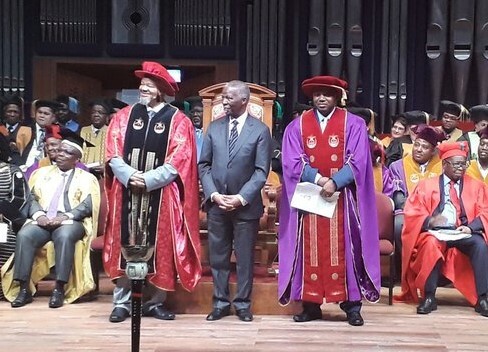 Former president Thabo Mbeki has been inaugurated Monday as the chancellor or the University of South Africa (UNISA). Mbeki was found to be a suitable candidate for the position as a result of his outstanding leadership and credentials. Mbeki’s foundation has partnered with the University of South Africa through programmes, including the Thabo Mbeki African Leadership Institute, Thabo Mbeki Presidential Library and South African Democracy Education Trust. Several ministers, African National Congress stalwarts and dignitaries attended the ceremony. Mbeki succeeded Nelson Mandela as Head of State in 1999 and retired in 2008. Considered to be one of the leading intellectuals on the continent, Mbeki’s appointment as the Chancellor of Africa’s biggest university could have not come at a better time. A former anti-apartheid struggle activist, Mbeki is revered throughout the continent for amongst others, his role in leading conflict resolution initiatives in various parts of Africa. UNISA says Mbeki’s appointment as Chancellor will help promote the university’s objective of repositioning itself as an African University.